The Mexico City Diablos faced off against the Sultanes de Monterrey this day in June 1991 and the Mexico City pitcher Antonio Felix had a career night. Mexico City won the game 9-0, according to the book Diamonds Around the Globe. Felix threw a no-hitter. Felix played that year in Mexico - and the majority of his career - after a brief stint in the minors in the United States. He played three seasons in the minors. He never made AA. 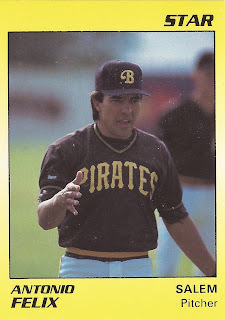 A native of Sonora in Mexico, Felix' pro career began in 1985 as a player in his home country. He played at Veracruz that year and moved to Cordoba and Leon in mid-1986. He arrived in Mexico City for 1987 and part of 1988. He was then signed by the Pirates. Felix played his first year with the Pirates between rookie Princeton and single-A Augusta. He went 3-5 between them, with a 3.49 ERA. He then played 1989 completely at Augusta. He threw a complete game, three-hitter in a May win. He went 9-12 overall, with a 3.98 ERA. Felix played his final year in the minors in 1990 at high-A Salem. He got into eight games and had a 7.54 ERA. He then moved back to Mexico. He played at Mexico City in 1991, then Veracruz again in 1992. He then continued there. His last recorded pro time came in 2002 at Torreon.